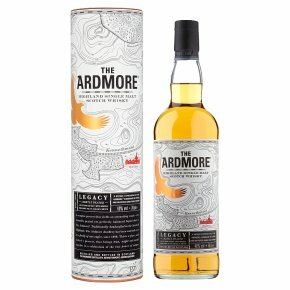 The Ardmore is a peated single malt whisky shaped by its deep rooted connection to the land, people and wildlife of its Scottish Highland home. 40% Vol.The Ardmore celebrates the distillery's unique location on the fringes of the Highlands, offering a lightly peated liquid that is sweet and uplifting. The gentle flavour fully captures the essence of this spirit's stunning Highland home. The Ardmore will appeal to experienced peated malt drinkers and newcomers, alike. Colour - Light golden. Nose - Heather Honey with hints of cinnamon and toffee bonbon. Very subtle hints of peat smoke. Palate - Creamy vanilla spice gives way to more overt smoky charcoal notes, especially with the addition of water. Smoke doesn't dominate and is balanced by the sweet honey and spice flavours. Finish - Full bodied, silky mouth feel with a dry, tangy and lingering aftertaste, coupled with delicious spice notes.